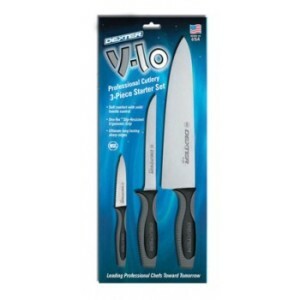 Dexter Russell V-Lo (29803) 3-Piece Knife Starter Set is a perfect combination of knives to start up any kitchen. Whether in the restaurant or in your own home, each knife comes with the patented V-Lo® comfort handle and unique Dex-Tex Armadillo texture that helps you keep firm control when using the knives. This 3-Piece Set includes; a 3 1/2 ” scalloped parer (29483), a 6″ narrow boning knife (29013), and a 10″ cooks knife (29253).